From the creator of The Roach Approach video series comes and entirely NEW STORY. Join Bruce Barry as he reads the Bible story of Noah's Ark adapted from the book of Genesis. Listen as Bruce's voice animates this exciting story along with music and sound effects. From the flood to the rainbow, children hear this classic story of faith and obedience. 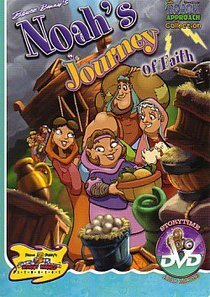 ^^The Story: Choose English or Spanish to see and hear the wonderful story of Noah's Journey of Faith with the colorful images from Bruce Barry's Wacky World Studios along with your choice of reading the story yourself, or choosing the storyteller along with music and sound effects. Read along on screen and change the language whenever you want by pressing "audio" or "subtitle" on your DVD remote control. The story also features PAGE BY PAGE reading. You can step through the story by pushing the [forward] and [backward] buttons on your remote and read at your own pace. ^^Vocabulary: Have fun learning words in English and Spanish. Use the number keys on your DVD remote control to change the word or language.^^It's a Wacky World: Discover the sights and sounds of Bruce Barry's Wacky World Studios. See the studio, learn more about the creator himself, and get a sneak preview of the video "The Roach Approach, Don't Miss the Boat! "^^Search the Web: If your computer has a DVD-ROM and internet connection, you can connect to the exciting Wacky World website (www.wackyworld.tv).^^Game: Play a game with your favorite ark animals using your DVD remote control. Just follow the narrator's instructions. About "Noah's Journey of Faith Storytime & More"